If you have ventured into this section of the site, I assume you might be a little curious about who I am and how all this came about, so let me introduce myself. Loyalist research and living history have been my passions for over twenty years. In 1976, at the advanced age of twelve, I became thoroughly caught up in our nation's Bicentennial. Switching from little league to reenacting, I proudly marched off in a Continental Artillery unit, taking part in all the events around New York City. I had been (and continue to be) a lifelong resident of Bergen County, New Jersey, and had read of all the history that had taken place in my neighborhood. A good part of that history involved the Loyalists, particularly those who served and fought in the 4th Battalion, New Jersey Volunteers, a regiment raised right here in Bergen County. Not enjoying my experience on the Congressional Forces side of things, I left their service forever in 1977 and helped found the NJV. I've been here ever since. My interest in research began in 1979. 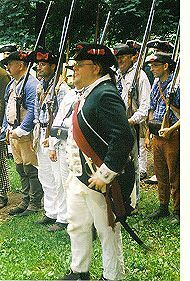 We wished to upgrade our clothing for the reenactment unit, to make ourselves as authentic as possible with an eye towards joining the Brigade of the American Revolution. The unit needed someone to sew and someone to research. I couldn't sew (luckily my cousin Steve could), but I found I loved to research. Books just didn't have the sort of information I needed. This inevitably lead us to the sources in archives and manuscript repositories, which indeed did have what I were looking for. The internet is a new challenge, and one with almost unlimited potential. After spending many an evening replying to query after query concerning folk's ancestors or people seeking research tips, I decided the time had come to try to focus and organize all these things. I wanted to give people a centralized place to learn some research tips, find out a little more about the war and Loyalist participation, and perhaps even find their ancestors. Not knowing anything about web site construction (how a series of zero's and one's translate into a portrait of Beverly Robinson is beyond me…), in 1999 I turned to Nan Cole, who I had come to know through the America On-line weekly Loyalist chats, and who very graciously volunteered to assist. In 2009, John Korchok of Word Lab Systems, and a re-enactor of Butler's Rangers, and here I am today. It has been a massive effort and will continue to be one for some time. But it has proved very enjoyable and I trust it will be worthwhile to our visitors. Thanks to John, this web site exists. I have no clue about website construction or anything of the sort, but he took to the project with zeal and energy and I think he's done a great job! One of the fun things I have found during these years of research is my own Loyalist ancestry. The Braisted family settled on Staten Island in the late 1640's, part of the Dutch settlement of New Netherlands. During the time of the American Revolution, no fewer than three Braisteds were Loyalists. John Braisted served in the 3rd Battalion, New Jersey Volunteers from January, 1778 till the end of the war, Peter Braisted served in the Staten Island (Richmond County) Militia and was seriously wounded in 1779, and Simon Braisted took the oath of allegiance to the British in New York City in 1777 and probably served in the militia there. As far as I know, they all stayed in America at the end of the war. In my opinion, that doesn't make them any less Loyalists than anyone else. And that's part of the point of this web site: this is where you will find information on all the Loyalists, not just the ones who survived the war intact and settled here and there, but all those who served the British somehow: overtly and covertly, briefly, lengthy, well and poorly. Not everyone was a hero. And not everyone was a villain. For the most part they were just average people living in extraordinary times, trying to live as they saw fit. Okay, I've preached enough here! Enjoy the rest of the site. If you want to find out more about me, please refer to my research resume. Thanks all for visiting!